Our study focuses on uncertainty in greenhouse gas (GHG) emissions from anthropogenic sources, including land use and land-use change activities. We aim to understand the relevance of diagnostic (retrospective) and prognostic (prospective) uncertainty in an emissions-temperature setting that seeks to constrain global warming and to link uncertainty consistently across temporal scales. We discuss diagnostic and prognostic uncertainty in a systems setting that allows any country to understand its national and near-term mitigation and adaptation efforts in a globally consistent and long-term context. Cumulative emissions are not only constrained and globally binding but exhibit quantitative uncertainty; and whether or not compliance with an agreed temperature target will be achieved is also uncertain. To facilitate discussions, we focus on two countries, the USA and China. While our study addresses whether or not future increase in global temperature can be kept below 2, 3, or 4 °C targets, its primary aim is to use those targets to demonstrate the relevance of both diagnostic and prognostic uncertainty. We show how to combine diagnostic and prognostic uncertainty to take more educated (precautionary) decisions for reducing emissions toward an agreed temperature target; and how to perceive combined diagnostic and prognostic uncertainty-related risk. Diagnostic uncertainty is the uncertainty contained in inventoried emission estimates and relates to the risk that true GHG emissions are greater than inventoried emission estimates reported in a specified year; prognostic uncertainty refers to cumulative emissions between a start year and a future target year, and relates to the risk that an agreed temperature target is exceeded. 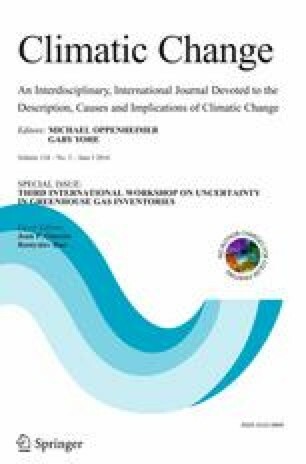 This article is part of a Special Issue on “Third International Workshop on Uncertainty in Greenhouse Gas Inventories” edited by Jean Ometto and Rostyslav Bun. The online version of this article (doi: 10.1007/s10584-014-1103-6) contains supplementary material, which is available to authorized users. This study was financially supported by the Austrian Climate Research Programme (B068706).